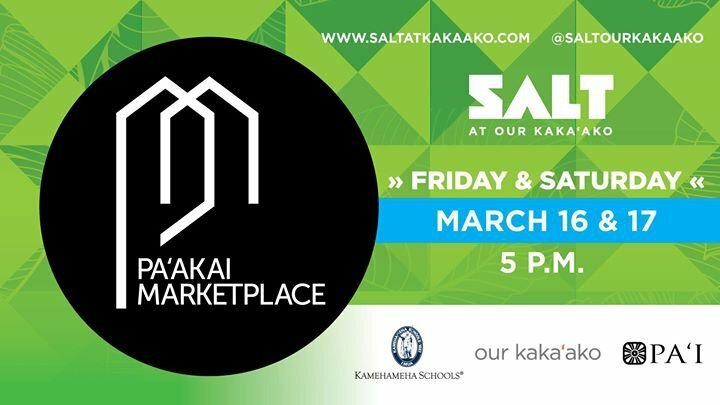 SALT at Our Kakaʻako’s monthly Pa‘akai Marketplace celebrates local artists on Friday, March 16, and Saturday, March 17. The cultural showcase brings together Hawaiʻi artists, crafters and cultural practitioners. Held in collaboration with PAʻI Foundation, it is a free family and pet-friendly event. On Friday, Pa‘akai Marketplace hosts a CD release party for “KUMZ,” Michael Casupang and Veto Baker of Halau I Ka Wekiu. The halau will be fundraising for its participation at the Merrie Monarch Festival in Hilo. Hoʻokena entertains at 6:30 p.m., followed by Casupang and Baker, and Halau I Ka Wekiu. Enjoy a free lauhaha weaving class led by Keoua Nelsen of iHala. Native Hawaiian hulu practitioner Mele Kahalepuna Chun of Nā Lima Mili Hulu Noʻeau will also be there with a free hands-on demonstration and talk-story workshop. Parking is available in the SALT at Our Kaka‘ako parking structure, accessible from Keawe Street. Additional parking is also available at The Flats at Puʻunui and Keauhou Garage. See www.saltatkakaako.com.